In there, I explained how you can use the built-in microphone in your laptop to become familiar with how REW works. I hope you have done that as it is critical to learn the program first before complicating it with external hardware and such. For real measurements though, you want to use a purpose-built measurement microphone and that is the topic of this installment. Measurement microphones are just that: designed for room and loudspeaker measurements and not necessarily sound good for recording and such. They also tolerate high SPLs (volume). There are a number of measurement microphones from multi-thousand dollar industry reference Brüel & Kjær (B&K) (see http://www.bksv.com/doc/ba5105.pdf) to cheap USB Microphones and some in between. Happily for what we are going to do, even the cheapest microphone will do. Our room response variations in low frequencies are many dBs, dwarfing any small accuracy differences between measurement microphones. Now, if you are doing this for a living and want to publish papers and such, and have others be able to replicate your work, then you need to buy the B&K and have it routinely calibrated. But that is not the business we are in. In the lower end of the market, you have a choice of buying a microphone that outputs analog signals and hence needs an adapter of sorts, usually a USB “sound card,” and typically one with phantom power. My strong recommendation is to not do that. Instead, get yourself an all-in-one USB microphone. These are plug-and-play. What comes out is a USB cable and both Mac and Windows PCs have built-in drivers for them. One criticism of USB microphones is that they may not work for timing analysis in REW. As you will see, we will NOT be using timing analysis in REW. In that regard, there is no compromise in using a USB microphone and you get all the simplicity of them with no drawbacks. The “in” microphone to use with REW seems to be seasonal thing. A couple of years ago when I bought mine, the Dayton Audio UMM_6 was the one to get http://www.daytonaudio.com/index.php/umm-6-usb-measurement-microphone.html. I just looked on Amazon for it and for some strange reason, it shows a lead time of 2 to 6 months to purchase from the company. Fortunately, Parts Express also sells through Amazon and they seem to have them in stock: http://www.amazon.com/Dayton-Audio-...d=1436622573&sr=8-2&keywords=UMM-6+microphone. As you see, the discounted cost is just $88. 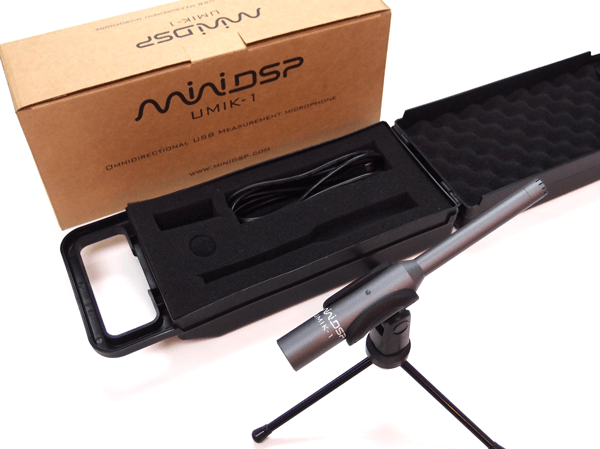 Another option is the Minidsp UMIK-1: http://www.minidsp.com/products/acoustic-measurement/umik-1. I can’t find a good price for that on Amazon but as you see in that link, the company itself sells it for $75. Before you hit the buy button, let me talk about calibration. Both the UMM-6 and UMIK-1 come with a serial number that you type online and it gives you a (supposedly) a calibration file to use with REW. My recommendation is to not bother! Yes, you heard me right. You don’t need a calibrated mic and these files themselves can be faulty. The difference between calibrated and non-calibrated mics is small and it is in a region that I suggest you use your ear, not an instrument, to adjust the sound. Now, if you insist on having them calibrated, there is a very low cost way to get there and that is to buy the above microphones from Cross Spectrum Labs: http://cross-spectrum.com/. For just $20 to $30, you get the same microphone but now it comes with a calibration file (or multiple for different angles). I was in a hurry when I bought mine so I bought it on Amazon. If I were not, I would have spent a few more dollars on Cross-Spectrum to support this nice service as calibration usually is a very expensive affair. But again, it is not necessary. Once you get your microphone, then all you have to do is plug it and either tell your operating system it is the default recording device, or tell REW to use it instead of the built-in microphone. Now repeat the lessons in the first tutorial. Compare the results to the built-in microphone. You should see less low frequency roll off and more accurate overall curve. In the next tutorial we will get into the meat of these of lessons which is to actually perform the measurements and understand what they mean. when can part 3 be expected? Hi, new to the forum and anxious to read the Return of the King. Sorry, third part, trilogy, part 3. I'm a pathologic LOTR/Hobbit fan. I'd love to learn more about room acoustics but the books I've tried are just too intimidating for my tired old brain. Thank you Amir for translating this stuff into something we can understand. My pleasure and my welcome also. So many projects and so little time but thanks for the reminder to work on Part 3. This 'dummy' ALSO votes for REW lesson #3 (and #4). "Keep Yourself Together and Don't Hurt No-one!" Here is the CSL file of my UMIK-1's response. It is down a couple of dB around 10 Hz, and has a fairly broad hump peaking a little over 3 dB at about 9 kHz, though the hump is only a dB or so used at 90 degrees as is more usual for HT measurements. The CSL calibration file renders it essentially flat and it measures the same as my Earthworks M30 from 5 Hz to 20+ kHz. The UMIK-1 rolls off sharply over ~20 kHz, however, where my M30 is flat to around 30 kHz. So, for normal measurements, I agree with Amir than calibration isn't really needed, but I like having the accuracy (especially for measurements when I want to point the mic at the speakers), and for the extra $25 or so consider it cheap. It does not match the noise floor or dynamic range of my M30, but frequency response after cal is a wash, which I think is pretty good for a $100 investment (compared to ~$700 for my M30, on sale -- I noticed they have dropped MSRP to around $900, down from $1200 or so when I bought me some years back). Good additions Don and Ray. Probably worth noting that, at least last I checked, the factory cal from miniDSP for the UMIK-1 is only 0 degrees but the usual measurement scheme is to place the mic on a tripod or whatever pointing straight up. That way it will cover all the speakers in an HT setup. If you do that and EQ flat, you'll be off a few dB in the 5~15 kHz region or so if you use the stock cal file. Back when I got mine, miniDSP was providing amplitude (sensitivity) correction for each mic, but the frequency response compensation was the same for all. I do not know if that is still true, nor how much it matters (i.e. the magnitude of the mic-to-mic variance in FR). The umik I bought about a year ago has two calibration files available for it online 0 & 90. Not sure if this is exactly what your referring too? I use a CrossSpectrum-calibrated UMIK-1 for Dirac on my 7.1 channel system. I point the mike up at the ceiling and I use the 90 degree mike calibration curve. I very much appreciate your analysis and graphs in this thread. I am not sure this is a big deal if you use the appropriate 0 vs 90 degree corrections. But, I would be inclined if measuring for room correction purposes to always point the mike up at the ceiling, even just for stereo. For room correction, you aren't just measuring output on the speaker axes, but omni room reflections as well. I would think pointed up is likely to give more consistent response via the mike's top hemisphere, free of the attenuation caused by the clutter of mike base and bottom, which likely would be facing a non-reflective carpeted floor in the upright position. I say this having looked at some vertical polar response plots of instrumentation quality omni mikes. They are called "omni", and they are pretty much, but not toward the bottom. Also, it is even less of a big deal if you are just interested in bass response, which is naturally more omni. How does that cal file differ from the ones MiniDSP supplies? For our purposes, the same. CrossSpectrum imports a batch, measures them themselves as an added service, tacks on $20 or so for the measurement, saves you $20 or so shipping from Hong Kong, adds US shipping, and that's it. Amir, thanks for the link, I have never been to that site (or not so's I remember). I certainly would not claim to be in Wayne's league as far as audio is concerned. I'll have to read through it later. Sal1950 et. al. -- 0 degrees means the mic is pointed straight at the source; 90 degrees means it is at right angles to it. In our case, 0 would be pointed right at the speaker, and 90 at the ceiling. The latter provides roughly equal pickup from all the speakers, useful in HT-type stuff, but you need to compensate the off-axis response. A few dB change over a broad range of frequencies is noticeable, at least IME/IMO, and the UMIK-1's peak is at the upper midrange where it is pretty easy to hear. YMMV. Note that even omni mics get directional as frequency goes up. The Earthworks measurement mics use a very small capsule to help reduce that effect but you can't completely eliminate it. Having a mic that gets directional well above the normal audio band helps, natch. Note pointing the mic at the ceiling is not a complete panacea. You can still get amplitude variance depending upon the height of the speakers and their dispersion relative to the mic, but putting the mic pointed up and at ear level seems to provide reasonable results. Another factor is ceiling reflections, since the mic will pick them up better than your ears. An argument has been made that our ears face forward so perhaps it would be better to cal with the mic pointing straight ahead. I have tried that, but it seemed to crank the surrounds and rears too much for my taste, of of course the FR was different (HF boosted from the surrounds and rears since the AVR doesn't know how the mic is pointed). For heaven's sake use a tripod to hold the mic, not a stack of books on a chair or couch, and definitely not in your hand (or on top of your head). It is too easy to get artifacts from mic vibration and movement that impact your results. I will sometimes hold an SPL meter just for a quick look but tend to place that on a tripod as well (probably overkill). Mine's on a short heavy HAM desk stand, on the top of the couch, with velcro markers on the couch and a velcro 'limiter", as it leans forward (to be at ear position). It lets me remove and replace it with really good positional repeatability, with that last horizontal quarter-inch found via the pink noise response at 20khz. I have not looked at what miniDSP provides these days for cal files. You get a unique by serial number on-axis calibration, and a 90 degree file. They found the delta from 0 to 90 degrees was very regular, and might use a 90 degree file calculated from the individual 0 degree file. I only use the on-axis, as I am to retarded to go multichannel (>2) here.